This mom’s testimony of kindness is just another example of why kids have the purest hearts. It was a quiet morning when Christy Lee Rowden of Oologah, Oklahoma took her two kids Asher and Mercy to the park this week. Since it was still early in the day, the youngsters spent the first part of their trip playing by themselves. 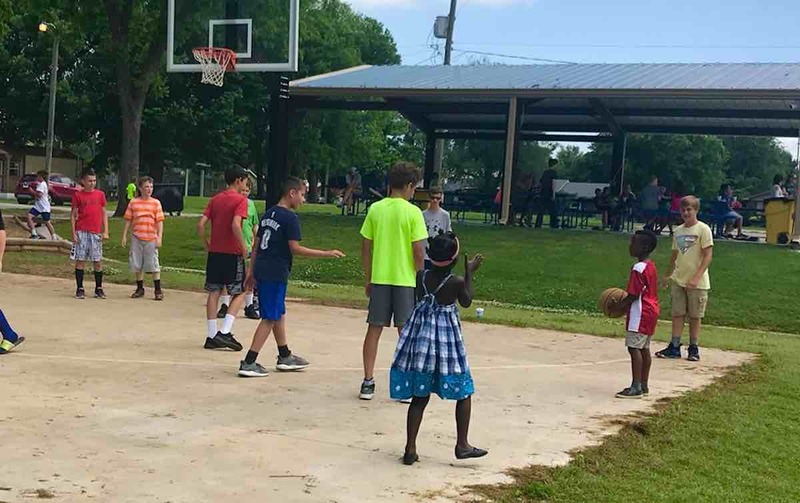 Then, a group of 5th grade boys from Oologah Upper Elementary showed up and started playing basketball. Rowden says that since she adopted 7-year-old Asher from Uganda, he can be shy around other kids as a result. But this time, as he quietly stepped back to watch the boys play, they approached him instead. “They were so kind – they included him by letting him catch and throw the ball and they cheered him on and high-fived him,” says Rowden. “It seriously brought tears to my eyes – especially being the mom of a black boy in a mostly white community,” she added. The video of the youngsters all hugging and encouraging Asher has been shared on Facebook hundreds of times – and it’s not hard to see why.